In recent weeks I’ve featured a few jewel beetles that I have encountered amongst specimens sent to me for identification (see “Aaack!-maeodera” and “Acmaeodera carlota in northern Arizona“). While the new distributions and even unknown species that they represent are fascinating from a scientific perspective, their diminutive size (~6 mm in length) probably makes them less than spectacular to the non-specialist. The family Buprestidae does, however, contain some very large species, including a few that qualify as bona fide giants. 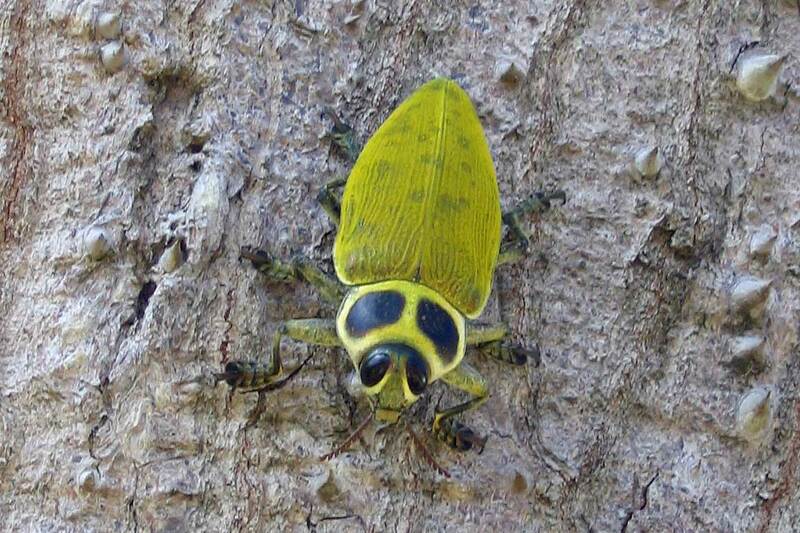 One such species, Euchroma gigantea (Giant Metallic Ceiba Borer Beetle), occurs from Mexico through Central America, the West Indies, and most of South America. At a maximum of 65mm in length, it is not only North America’s largest jewel beetle, but also the largest jewel beetle in the entire Western Hemisphere. My colleague Steve Meyer encountered and photographed this individual in Negril, Jamaica. Although its scientific name translates to “colorful giant”, the beetle in the photo is especially so due to the delicate, waxy bloom covering its elytra. This bloom is secreted by the adult after transforming from the pupa and prior to emerging from its larval host, giving it a bright yellow-green appearance. After the beetle emerges and becomes active, the bloom is quickly rubbed off and the beetle takes on the shiny, iridescent purple-green color by which it is more familiar. The presence of bloom on this individual suggests that it had just emerged from the trunk of the kapok tree (Ceiba pentandra) on which it was sitting. Kapok and other large trees in the family Bombacaceae serve as hosts for larval development for this species (Hespenheide 1983). Indigenous peoples in Central and South America have long utilized the dazzlingly colored elytra of these beetles to create beautiful natural jewelry and adorn their clothes and textiles. The species is also eaten in both the larval and adult stages – Tzeltal-Mayans in southern Mexico (Chiapas) roast the adults when available, and the Tukanoans (northwestern Amazon) also eat the larvae (Dufour 1987). I have eaten a few insects in my day, but none as thick and massively juicy as the grub of this species must be. Holometabolous larvae typically contain a rather high percentage of fat (up to 66% dry weight) to meet the demands of pupal development and adult reproduction, and I suspect this makes the larvae quite tasty (especially when roasted). If there is any insect in the world that I really, really, really want to eat – it is the larva of this one! Dufour, D. L. 1987. Insects as food: A case study from the northwest Amazon. American Anthropologist 89(2):383–397. Hespenheide, H. A. 1983. Euchroma gigantea (Eucroma, giant metallic ceiba borer), p. 719. In: D. H. Janzen [ed. ], Costa Rican Natural History, University of Chicago Press, Chicago. This entry was posted in Buprestidae, Coleoptera and tagged beetles, entomology, entomophagy, indigenous cultures, insects, jewel beetles, nature, North America's most..., science, West Indies. Bookmark the permalink. Love the commentary, Ted. I photographed one of these beauties in Belize back in December. An easily identified buprestid, yay! Thanks, Lee. Yes, they are one of the few easily identified bups! I’ve never seen a live one myself – yet. Can you imagine dropping one of those larvae into a deep fryer – I imagine it would taste like a massive funyun! I have a few specimens of this species in my collection (obtained from others), and no evidence of the yellow bloom remains on any of them. What a striking appearance it gives to an already impressive beetle. Oooh, I used to have one of those! I picked it up at an insect show in Montreal when I was an undergrad…it got damaged in a move though, so I gave it to the educational department at a natural history museum (already broken, so no one would panic if a kid snapped off another leg or two). It truly is a gorgeous insect and impressive in size. I should like to have another one. I did NOT know about this “bloom” they produce. What is it? What’s its purpose? Do other buprestids do this? As for eating the larvae…yerk. I’ve eaten moth larvae before, but they were stir-fried and crispy. I don’t think I could handle the “massive juciness”. Powdery yellow bloom is actually quite common among buprestids, but mostly in species that occur in the deserts – Gyascutus especially. In those species it seems a bit more durable, and it seems reasonable to assume it has a thermoregulatory function by reflecting sunlight to prevent overheating. I’m not sure what it’s function in this tropical forest inhabitant would be, especially since it rubs off so easily. What a beautiful beetle. I suspect that they yellow waxy bloom is similar to the yellow on the elytra of Gyascutus caelata. Yep, see my response to TGIQ – but the bloom on this species is more neon yellow, while in Gyascutus it is pale yellow-white. It’s also pretty easy to preserve the bloom on Gyascutus – I’ve never seen a preserved Euchroma with the bloom still on it. I suspect they have similar origins but serve somewhat different functions, given these differences and the different habitats that the two beetles live in. I’ve seen deep fried just about everything at art fair food courts, but so far no beetle larvae. What a gorgeous beetle. And respectably sized as well. Though I’m a tad–er–grossed out with all the chat of nibbling on the poor critter or its children. Personally–and I feel safe saying this since I have no idea what I’m talking about–I think the bloom evolved as a natural version of talcum powder, a way to absorb restricting moisture and reduce friction when the imago wriggles from the dried shell of the pupa. Selection in other environments caused it to take on other uses. My sweaty sneakers agree with this finding. The ability to gross out others is one of the great delights of being an entomologist! OT, but I enjoyed your interview over on the nature blog network. Thank you, Alex – it was fun! I’ve found a dead/dying example of this beetle in Kingston, Jamaica. Is anyone interested in receiving it as a specimen? I have a similar beetle and i have fallen in love with it, i also would like to know what to feed it. Adult jewel beetles don’t live very long but can be kept in captivitiy for a time. Feed with a cotton ball soaked in 10% solution of sugar water solution.